Russia has recently introduced a new all-terrain vehicle (ATV) has capablity of crossing different types of extreme terrain snowing up to the surface of the water can be crossed by this vehicle with ease. 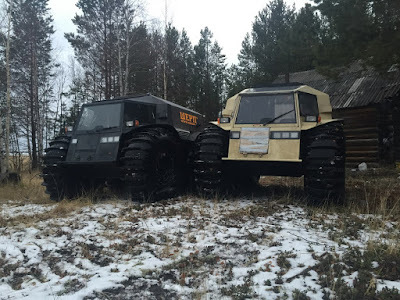 As quoted from Carscoop, Alexei Garagashyan created one of the most impressive vehicles we saw in recent years in the form of the Sherp, designed to have the same performance as ATV but the Sherp is equipped with 4 huge custom self-inflating tires for easy devour the obstacles with a maximum height of 70 cm (2.3 ft). 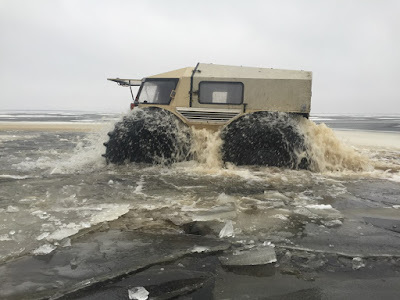 With tiny body and huge tires also allow the Sherp remained agile over snow-slippery roads to drive on the surface of the water and pretty light too, weighing just 1,300 kg (2,866 lbs). While on the water surface this vehicle can swim at a maximum speed of 6 km/h. For the machine section, Sherp only rely on a four-cylinder 1.5-litre Kubota diesel engine with maximum power up to 44 hp. And has a top speed reaches 45 km/h (28 mph), by using the 4WD system. A skid-steer system allows it to turn in its own length which is 3.4 m but also to claim the title of the most fun tank-like vehicle we’ve ever seen.